François, born in 1755, was the second, but eldest surviving son of Joseph Marie Pineault dit Deschatelets and Marie-Gabrielle Sullière. For her part, Marie Louise, born in 1758, was a younger daughter of Jean-Baptiste Colle and Marie Josephe Paule Martel. Jean-Baptiste, originally Valentin Cole from Boston, converted to the Roman Catholic faith a few months before his marriage to Marie Louise’s mother in 1753. François and Marie Louise were the parents of six children (two sons and four daughters) before Marie Louise died aged 30 in December 1788. Four years later, widower François married Marie Angélique Duquet, by whom he had eleven children. He died in 1833. 1. 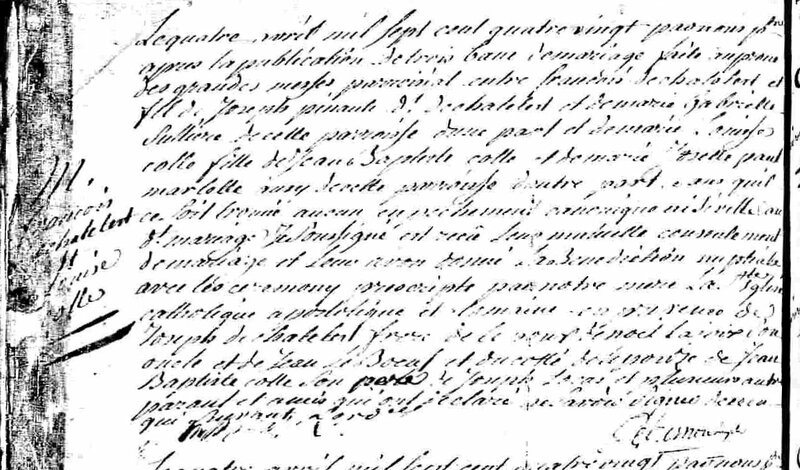 St-Pierre-du-Portage (L’Assomption, Quebec), parish register, 1777-1782, p. 78 verso, no entry no. 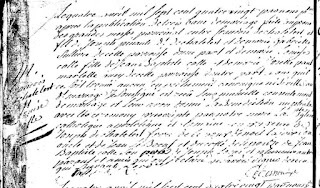 (1780), Francois Dechatelest – Marie Louise Colle [sic] marriage, 4 April 1780; St-Pierre-du-Portage parish; digital images, Ancestry (http://www.ancestry.ca : accessed 11 February 2011).